Two CFM LEAP-1A engines successfully completed a five-hour, 29-minute flight powering the new Airbus A321neo, paving the way for delivery of the first LEAP engines on the largest member of the A320neo family in 2017. “We could not be happier with the LEAP engine and are proud of the many ‘firsts’ such as today’s flight it has powered throughout the A320neo flight test program,” said Jean-Paul Ebanga, president and CEO of CFM International. “We have confirmed that the engine is meeting its performance specifications, and the reliability and durability it has exhibited throughout testing is a glowing testament to the professionalism and expertise of the team that is bringing this product to market. We can’t wait to begin introducing it to our customers later this year. On behalf of the entire CFM team, I congratulate Airbus on the continued success of the A320 family flight test program. 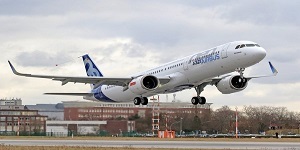 “The LEAP engine began flight tests on the A320neo variant in May 2015 and has logged more than 1,000 engine hours to date on more than 200 flights to support aircraft certification and first delivery in mid-2016. The engine received joint U.S. Federal Aviation Administration and European Aviation Safety Agency certification in November 2015. Since the introduction of ANSYS, more students are using first principles and FEA to validate their designs. This year, more than 60% of the projects were using FEA as a standard approach for numerical calculation. This number shows the huge impact ANSYS, had on University of Pretoria. FEA is not anymore a specialised tool for few users but a standard engineering tool easily integrated in the design process. At Aerospace, we have successfully used the ANSYS suite of tools to design high-performance gas turbine engines. Throughout this program, Qfinsoft provided valuable support and assistance to accelerate the development of our models. Their accessibility, short-turn around times and willingness to go beyond what is expected make them an effective partner on our projects.